The ability to deliver consistent, engaging and true-to-life chemical hazard detection training scenarios relies on regular access to realistic, hands-on equipment. What's vital is that these training tools replicate not only the readings and the responsiveness of real detectors, but that they also provide trainees with an authentic experience that recreates the potential challenges that they will face in actual incidents. Planning exercises for modern-day CBRNe and HazMat threats has never been more complex, with the need to respond to anything from clandestine laboratory searches to major industrial incidents, chemical improvised explosive devices or terrorist threats. And key to the success of any training scenario is the capacity for instructors to be able to create compelling training experiences that are straight-forward to set up and easy to repeat. While training with Live Agents (LAT) can still have a role to play, it introduces a substantial degree of risk to instructors, students, their equipment and the environment - not to mention incurring greater cost, increased administrative effort and a heavier regulatory burden. Simulant training is often viewed as presenting a safer "middle ground" for CBRNe and HazMat exercises, bringing with it the advantages of a more credible, real-life experience but at the same time reducing risk through the use of smaller, controlled quantities of substances. But even in the most carefully managed of exercises, the use of simulants brings with it certain disadvantages. It can often restrict the breadth and variety of scenarios - for example, when they are required to be used in confined spaces, or where wind, temperature or training location can impact negatively on the learning experience. It is also increasingly common for modern detectors to provide limited response to simulant sources, due to their highly developed interference rejection (IR) capabilities. The good news though is that safe, high-quality and easily repeatable CBRNe/HazMat training needn't be so complicated. One solution that has revolutionized modern approaches to chemical detection training is the adoption of innovative and safe detector training aids that replicate the functionality of real devices. These intelligent, electronic training tools place instructors in control, they are environmentally friendly, they can be set up in an unlimited variety of indoor and outdoor locations and they offer powerful after action review features. Let's now take a closer look at one specific example of a chemical hazard detector - the Smiths Detection LCD3.3 - and its simulator equivalent - the LCD3.3-SIM, also known in the USA as the M4A1 JCAD and M4A1 JCAD-SIM respectively. The Smiths Detection LCD3.3 is a person-worn device which is reported to be the most widely deployed chemical detector in use today. It is used for the detection of Chemical Warfare Agents (CWAs) - including nerve, blood, blister and choking agents - as well as for the identification of a selected library of Toxic Industrial Chemicals (TICs). The detector also incorporates different operating modes ensuring optimal detection capability. The detector is simple to operate, requires no calibration or routine maintenance and can log up to 72 hours of mission data for further analysis while user replaceable sieve packs reduce the need for factory based overhaul. A key benefit of this detector is its ability to specifically identify CWAs, however this advanced selectivity and makes simulant based training challenging. The LCD3.3-SIM is a training device that has been designed replicate the features and functionality of the actual LCD3.3. The simulation detector responds to electronic sources that imitate the effects of chemical vapors, toxic substances and false positives and that realistically replicate the effects of wind direction and temperature, the depletion of sieve packs and batteries, confidence testing and the use of a survey nozzle. With no requirement for simulants as part of training, there is zero possibility of environmental contamination or health and safety risk to instructors or students. The device is compatible with a wide variety of other simulators (including simulators for the AP2C, AP4C, CAM, LCD3.2 and the RAID-M100) which means that multi-detector and multi-substance training can take place within the same scenario. The inclusion of a remote control feature provides CBRNe and HazMat instructors with complete management of the exercise - from deciding on the effectiveness of decontamination drills, to simulating the effects of wind, temperature and persistency and the ability to instantly reset a scenario in readiness for a new exercise. 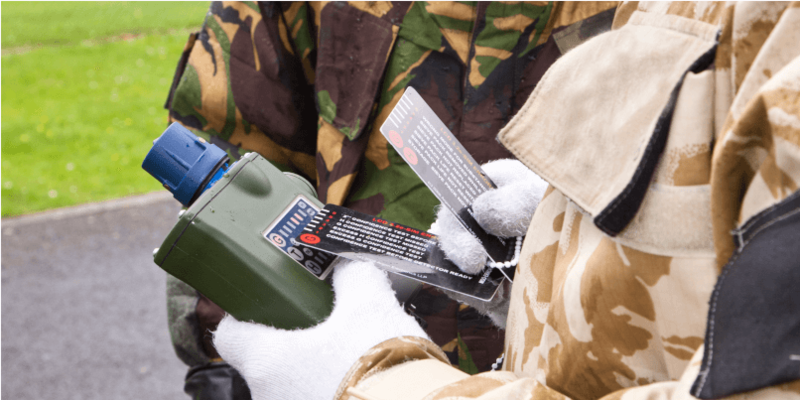 After Action Review (AAR) enables instructors to confirm that their students have set up and used the detector in accordance with the procedures for the real-life device. In the event of student error, the student performance reporting feature provides a detailed breakdown of their actions to assist with learning. The use of innovative simulator detector training systems significantly increases personnel safety, as well as enhancing learning and easing regulatory pressures. Such devices also place the instructor firmly in control of the exercise to ensure you're delivering consistent, verifiable and measurable CBRNe/HazMat training outcomes.